October 4, 2013 October 6, 2013 Posted in Travel Posts. I have been a bit slow to write about this but for me it’s a very significant moment in my experience here, I have finally left the comfort of the Hotani Nature Farm but not before experiencing some amazing things. The first I need to tell you about is the typhoon that passed through the farm, yes… a typhoon. I don’t know how bad a typhoon it was but it rained for nearly 48 hours and had some very high winds to go with it, more importantly for the farm it certainly left it’s mark on the land. The damage to the fields was not vast but was significant, there was a bit of a warning that it was going to hit so preparations were taken as much as possible, land waiting for new crops was covered, things were tied down and made secure. When it was all over a beautiful thing happened, the skies cleared and the community pulled together to clean up what had happened. This is yet another thing I love, the feeling of community here, there is a road that leads up to some of the farms, during the storm this got ruined by all the water coming down it but the community pulled together and repaired it somewhat. Over the next few days our work involved repairing what the typhoon did to the land, which also included removing some land owned by the host which fell onto a neighbouring farm. For four or more days we shovelled, picked, sweated and repaired until things were back to normal. Let me tell you a little about the two more days that I have taken off. For the first one more days off, for the first one I headed out to a place called Nara. This city was the capital of Japan around the year 710 and it has a beautiful national park right in the heart of the city, the park is dominated by deer. According to the history a mythological god arrived in Nara on a white deer and since then the animals have been regarded as heavenly protecting the city and the country. 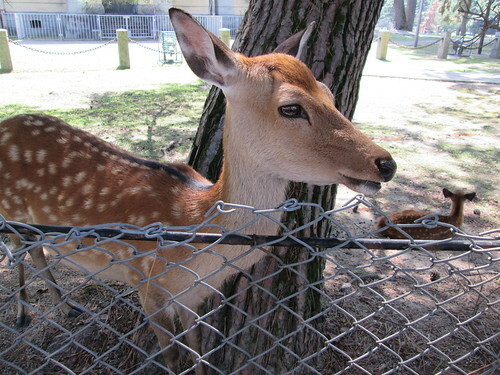 The deer are a tame Sika Deer who actively come and harass tourists for treats old all around Nara by vendors for ¥150. The second outing was to Kyoto, the great thing about working on the farm where I was is that it is almost equidistant from Osaka and Kyoto which is really useful if you want to explore both cities while you WWOOF. I have noticed one major thing about Japan, I knew that comics were part of Japans culture, it has been here for as long as I know and it is not a weird thing for adults to read comic books, in fact in every convenience store there are comic books to buy, very unlike the UK which forces comic book nerds into specialised shops which are slowly dying out. 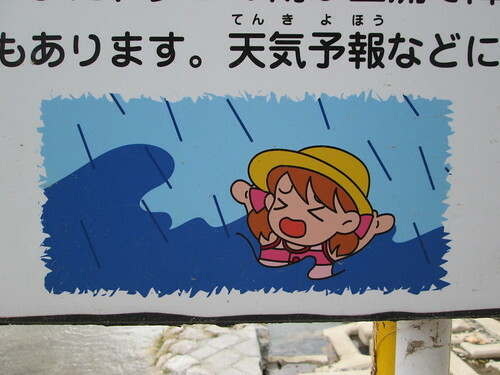 They do use comic style characters for virtually everything which i sometimes find amusing, I mean check out this warning sign telling you it’s possible to drown. Leaving the farm was a very warming experience, I must say a part of me will miss the daily routine and the people I have been working with, but I must travel a bit more. On the last night we had some drinks and a bit of a leaving gathering and it was lovely today to give and receive hugs and handshakes with equal sincerity. I can only thank the people from the farm for having me. From what I was told by one of the staff they have really enjoyed having me there, I have been more than helpful for them which for me is total and utter satisfaction. The knowledge that I did something to the best of my ability and it was appreciated will stay with me for a long time and nobody can ever take that away from me. I mean maybe I’m not actually cut out for the corporate norm world that I have been in? Working on the farm ha really made me question this and even winder how I can find a job that gives me the same satisfaction I have right now after leaving the farm. I have already signed myself up for some more WWOOFing down in Hiroshima in about a week or so time. From there I move on again south on towards Fukokua or I may roam all the way down to Kagoshima and from Fukokua I will leave Japan for a while. No, it’s not time to go home just yet, but I will save what is happening next for another post.